One of our messiest parts of our home is the garage. We spend a lot of the Summer months working on DIY projects so it typically gets out of control with scrap wood lying around, tools pushed off to the side, paint supplies sitting here and there. If you like to DIY as well then i’m sure you know exactly what I mean. Well it is getting closer and closer to wanting the vehicles in the garage for the colder months and now is the time to get everything organized. That is what we spent time doing over this past weekend. This is what our lovely garage looked like before we got started. See what I mean about stuff everywhere? We wanted a few things to use for organizing so I popped over to Home Depot and picked up some storage supplies. If you are looking for some to do the same then I found some great deals on the Rubbermaid Roughneck totes and the Rubbermaid Roughneck trash cans. That was our biggest project was to get everything organized. We use our garage and shed to store our holiday decorations and outdoor items so being organized is a must. 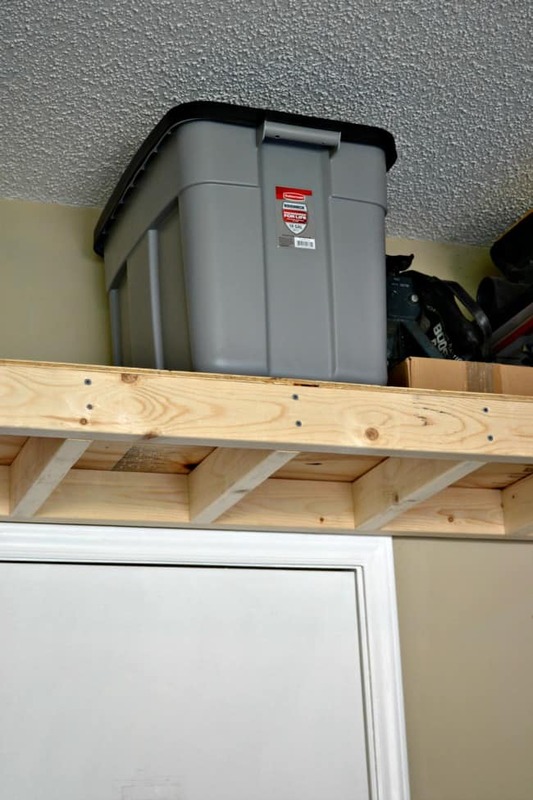 When we first moved in here not to long ago my husband built this elevated storage over his tool chest and door. It made the perfect spot to place the 18 gallon totes. Which we put all sorts of items in from outdoor pillows, holiday storage and even random tools. Of course if you are a diyer who likes working with wood then you know that you have scraps all the time. Valuable scraps too, you never know what you can make out of leftovers so don’t throw them out. 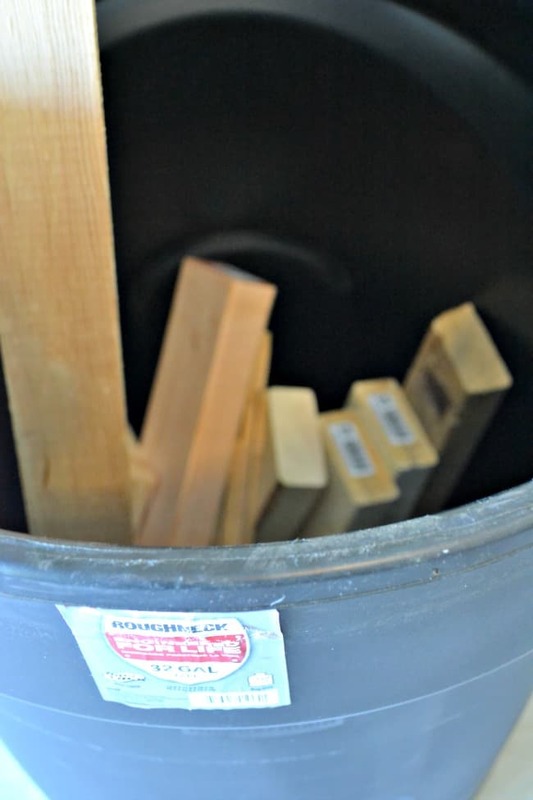 When we were thinking about something we could easily place all of our scrap wood pieces in a large trash can came to mind and it works perfectly for containing these items. It took nearly all weekend to get everything situated but I think we are official ready for fall, at least in the garage. Does your garage need to be tackled too? I just purchased some of these totes. We have the garage sale still up in the garage and we need to pack it up so we can bring the cars in the garage to keep them as safe as possible from the salt and snow. My husband was just talking about cleaning the garage today actually. I think he is doing it this weekend. Ours has needed it for awhile. We get to working on DIY projects and it kind starts looking like a crazy mess. Our garage definitely needs an overhaul. We have racks to store things, but it’s never enough or its not the right kind of storage. when it comes to The Hubs tools, I don’t even touch them! I know what you mean. I can’t ever seem to have enough storage. My garage is packed full of stuff! We always laugh when we pass neighbors who have empty garages- where do they PUT everything??? Haha! If we didn’t have our shed to store a lot of our extras then our garage would be packed full too. Those are great handy tubs. Very sturdy also. Our garage is a dumping ground and has been since we moved in 6 years ago. It’s in a very sad state – about half of our belongings are organized in storage bins. I’m itching to ditch the boxes and replace everything with plastic bins. Husband is kind of obsessive. We always use storage bins and have his scrap wood in a Rubbermaid garbage Pail like you have. We have a second for kindling for our fireplace insert. YOu guys are doing an amazing job. We definitely need to straighten up a few areas of our home. I have been meaning to tackle cleaning my garage for a while. I need to get some of those totes! This is totally why I am glad we don’t have a garage! Of course, we have a shed and it’s a complete mess! Rubbermaid storage totes are great. We use them all the time. They’re very durable. 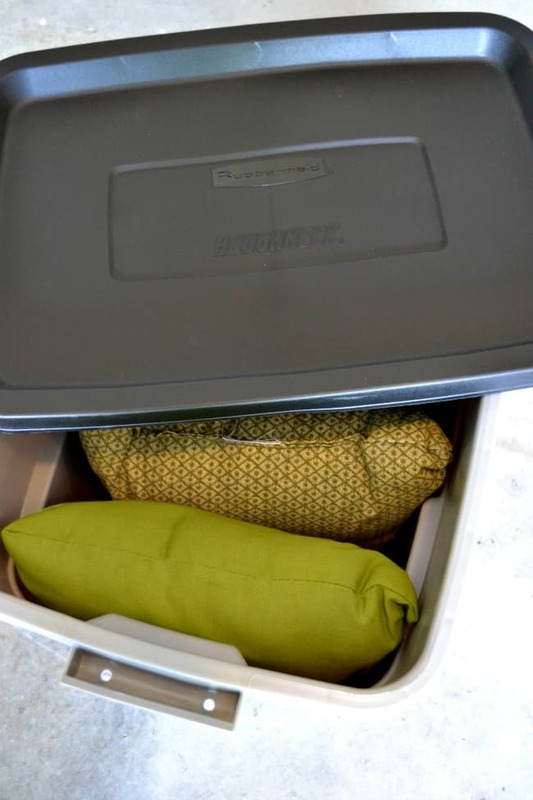 Storage bins are the best for keeping all your stuff organized and out of sight. Rubbermaid is the best. I love Rubbermaid totes. They’re really great. We have a ton of them, and I’ve really put them through the wringer. 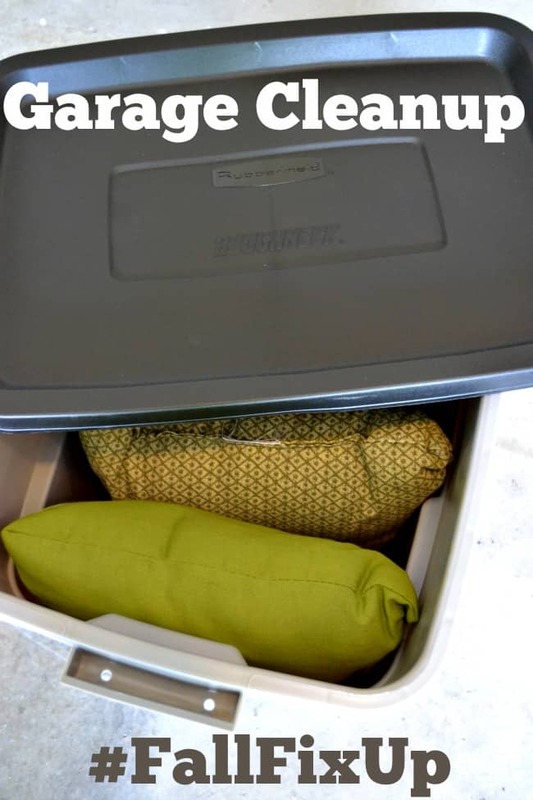 Rubbermaid storage totes are great! They hold so much, and they’re very tough. My garage is fine. It’s everything else that needs to be cleaned up. ha!! Funny you ask! We just tackled it this past weekend! Got everything set up in totes! Our garage is a pain in my backside. I have been on a mission to get it organized. We totally need to install shelving. lo my whole house needs to be tackled, now that the kids are back in school I’m starting to tackle it. 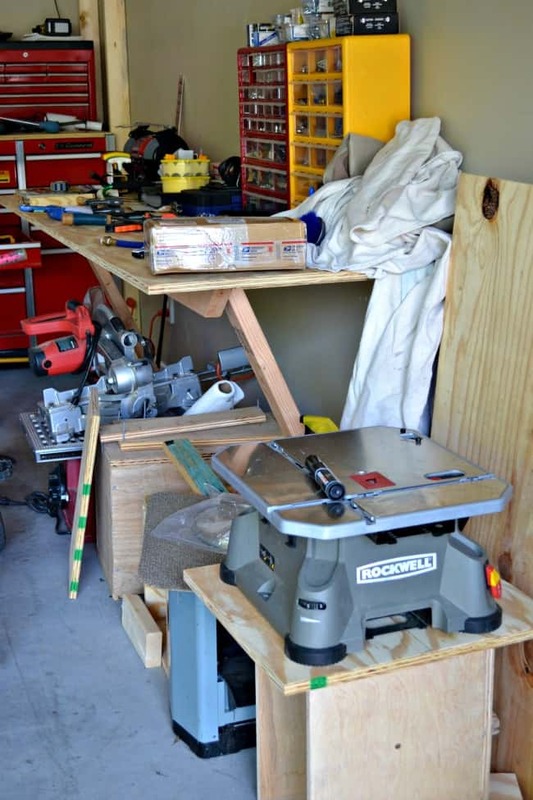 Our garage is one of the cleanest places in the house thanks to garage cabinets and shelving. Our basement, however, is an entirely different story. I could use Rubbermaid bins to help organize but also to secure keepsakes that we store. Yes, we need to do a good fall cleaning in our garage. We just never seem to have the time, but we need to make time. Ours is organized but it needs to be cleaned and painted on the inside. In fact, it could use a new paint job on the exterior door too, to freshen it up a bit. Rubbermaids are amazing. We use them down in our Storage Room to hold just about everything! Such fantastic storage containers. They hold a lot too. I wish we had a garage, it would be so beneficial for storage reasons, this is a great idea to get ready for Fall season and you look so organized in your pictures with your garage. Love it so much! I need to clean out my garage too! I should look into getting some of these bins! We just moved into our new house so our garage has turned into the catch all room. We have tons of storage bins in there. I loved how easy the bins were to pack,move then store. Way better then boxes. My garage is a hot mess! I need to get organized. Thank you for these tips! When the cool weather returns, I’ll go back out to the garage and organize more. You have some great suggestions here. Thanks! Our garage is a disaster area! It is hubby’s area though so I don’t complain too much. I know he was out there all day Saturday “organizing” but for the life of me, I don’t see what. I used my last garage soooo much, so I totally appreciate your organization tips. I don’t have one in this house but next house I’m getting one again! My garage is okay. I sure could use some new garbage cans though. We have lots of storage containers at our house. I love having the clear ones so I can see what’s inside the container.